Saturday’s long planned Fishguard Bay Ocean Race avoided cancellation due high winds by running a shorter course within and just outside Fishguard Harbour. Then the hard work began – muscles aching and breath burning the lungs as the fleet made their way the last 2 1/4 miles back to Goodwick Beach. 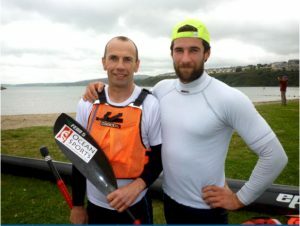 The first two boats fought neck and neck all the way to the shore where Lewis Kirton managed to leap out and run up the beach, beating the current GB champion, Mark Ressel, to the finish line. This makes Lewis and Steve Kirton the first winners of the Fishguard Bay Ocean Race trophy, hand-carved by Pembrokeshire artist Robert Jakes. The first of the masters class (over 40), Adrian Croucher, was only the third boat across the line. A little later the race’s only lady, Lizelle Kemp, who drove 500 miles down from Dundee to compete, won the ladies’ prize, also claiming the GB Oceanski ladies’ points series. Chairman of Pembrokeshire County Council, Councillor Tony Brinsden, presented the prizes in the packed Ocean Lab coffee shop where all the class winners collected their medals and other generous prizes from local businesses, including Fishguard Bay Resort, Celtic Camping and Bunkhouse Accommodation, and iCatcha handmade jewellery.